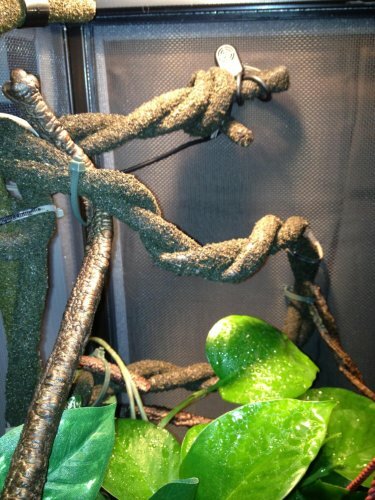 I finished building out my Cham enclosure this weekend. First time doing it. Took me quite of few weeks of braing storming, reading the forum posts, and getting items together. 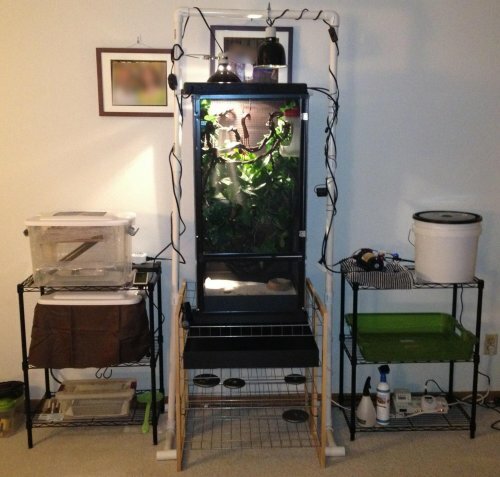 Its up and running now so I will keep an eye on things for a week or so and if everything looks good and no issues, then I will actively start looking for a Jacksons' Chameleon!!! What do you guys think? Did I miss anything or anything major you folks would want me to change/watch out for? The biggest thing i want to do was to not have anything touch the floor of the enclosure. that will help me clean out any water build up from misting etc. 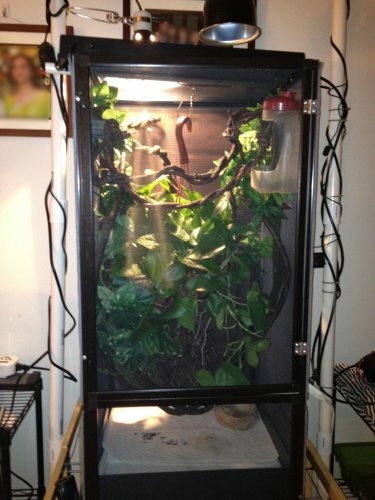 My enclosure for Dubias and Crickets is kinda a work in progress. 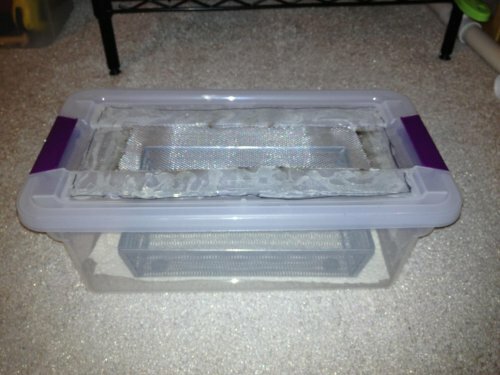 Going with Kricket Keepers because I don't intend on keeping more than 30-40 crickets in there at a time. 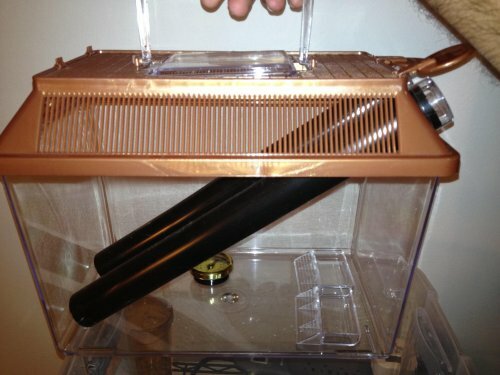 Yet as a fail safe (i can't have escapees), I have the Kricket Keeper inside a plastic tub with screen mesh glued to the side and top to facilitate airflow. 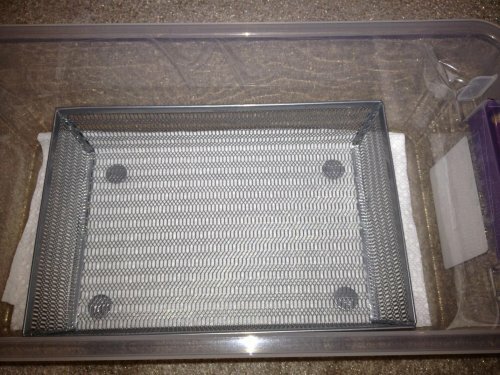 I also have mesh to the top of the Kricket Keeper (in place of the plastic viewing window) for more air flow in there. 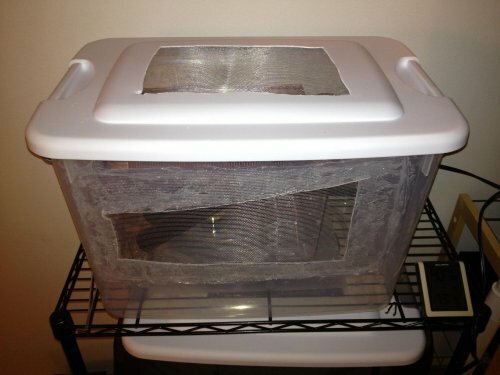 For the Dubias, its a similar setup, except i have a peice of cloth wedged between the tub and lid because they need more darkness. Have Rephasy Bug Burger for both feeders + other gutloads of course. For silkworms I tried to follow the idea couple of members mentions on the forums i.e. upside down plastic box with base cut out, plastic mesh placed on wodden dowels and the lid of the box being removable to get rid of the fras. I tried doing that 2 times but both times my projects failed. so I opted to get a screen tray from the store and it fits pretty well into this plastic bin. Hopefully the fras falls thru the mesh and into the bottom the bin for easy cleaning. I know there is a water bowl at the bottom of the cage but it was only there because i was mucking around with the nozzle of the mistking and it was there to collect the leaking water. 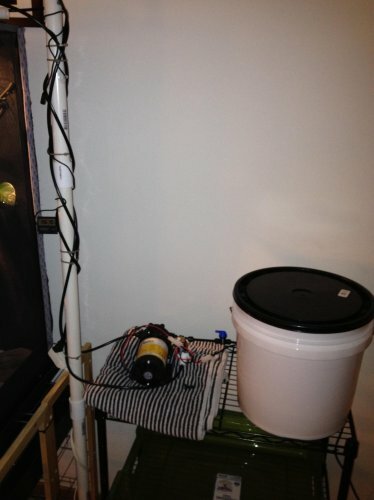 Coat Hanger twisted around a pvc pipe to hold the plant. 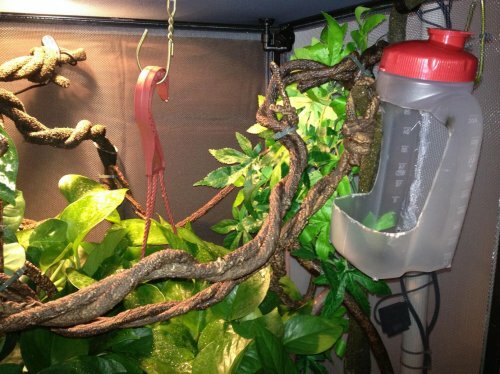 the PVC pipe is slight longer than the cage so that way, the weight of the plant and pot falls on the fame and not the mesh. It looks like you have done a great job. I like the PVC to hold the hose. I do see my cages get some vibration from the hoses. If you have humidity issues, add a couple more lice plants. It is also good you are ready with a plastic liner to wrap part of the cage. I have had to do that on all of mine. Now all that is left isa good picture of your cham. Looks like you are prepared, looking forward to seeing your cham. Good luck! Thanks Laurie.vwill look into lice plants. Have never heard of them before actually. Probably a typo for 'live'. It looks wonderful, you've gone all out! You will make a wonderful chameleon keeper! I would put a screen over the water dish and make sure those coat hangers will not rust, the water/humidity will rust them quick. Oh and the cricket feeder.... did you cut a hole in the bottom and put a screen over it also? If not the crickets can drown from misting. Now all that is left is a good picture of your cham. ah. 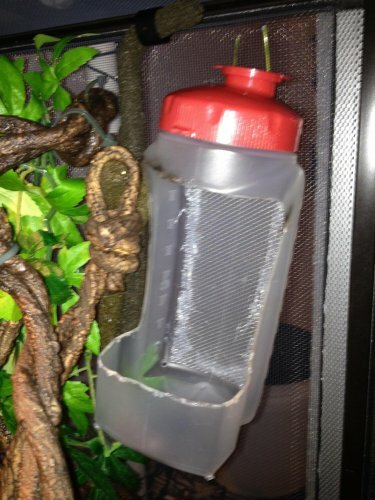 "Live" makes a lot more sense than "Lice"
For the cricket feeder/bottle, yup i do have 4 tiny holes in each corner of it so as to drain any water that might collect. didn't need to put a screen on it because the holes are very small and i don't think i will be getting any circkets that are that small. So far I haven't seen any of the spray from the mistking reach the bottom of the feeder. seems to be relatively dry. Coat hanger: Didn't know about the rust issue did not take it into account when i was planning out the build. Might have to change the hanger if rust gets to it. any ideas to get around it? i.e. to avoid rust. @camimom: I did try the fishing line technique to hang the plant but it didn't work too good. the hanger technique seemed easier but didn't account of it rusting down the line. 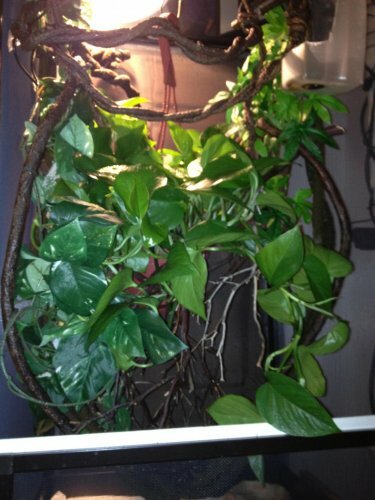 if you hang it, and train yourpothos, you can make it grow up the string to hide it from view. I have used the fishing line with success. I got the 50lb test line @ walmart and doubled it up so it had 100lb strength and held a large pothos fine until i took it down. Also the thin fishing line worked good because it fits thru the screen top no problem. I think the strength of the fishing line might have been an issue. I had picked a simple one up from Target vs a specialty store. I did have a hard tying knots to it though. 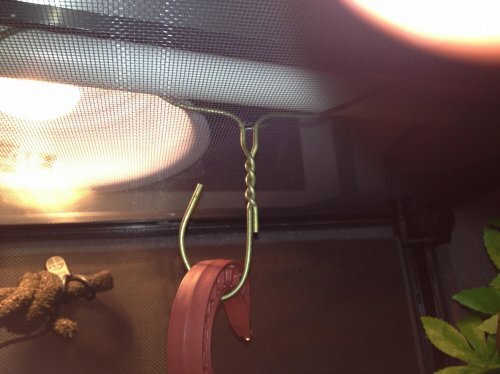 my cages are like that. but right now i dont have pics. ill take some later this evening.